In a Special Presentation to Thomas Smith on retiring from the 911 center, we saw a rare use of the county’s video camera to display the podium at the front of the room. Escalated from contingency fund to SPLOST payment (we still don’t know how much): fixing the James Road 10-inch drop in 48 hours in front of Westside Elementary School due to faulty road construction in 2008. Also due to that same hasty 2008 James Road widening and realignment for the James Road second mall and massive subdivision mega-project that never happened, they scheduled a Public Hearing for abandoning Excess Right of Way on James Rd & Riverside Dr. And they voted to fix three discrepencies MIDS, Inc. found in its contract of last year. They voted for the low bid on the lift station pump without ever saying what the other bids were. They reappointed Airport Authority Chairman Steve Everett for another four-year term; he did not appear. They approved the 911 Center surplus item sale. They scheduled a Public Hearing to abandon part of Old Statenville Road SE because they say only seven cars a day, no, now it’s ten cars a day, use it and there are no houses on it. Nobody had any questions about the a beer license. And the County Manager said a quarantine on the Animal Shelter was being lifted and the next Work Session would be Tuesday (27 May 2014) because of the holiday (Memorial Day). WORK SESSION, MONDAY, MAY 12, 2014, 8:30 a.m. REGULAR SESSION, TUESDAY, MAY 13, 2014, 5:30 p.m.
Lame Duck Reverend Commission Richard Raines prayed for unity and justice. Video. Thomas Smith is retiring from the 911 Center, after joining September 1993, before the actual center opened in October. County Manager Joe Pritchard said Smith was instrumental in getting CALEA certification. They could display applicants for boards and authorities at the podium, and Citizens Wishing to Be Heard, if they wanted citizens to see what was going on. Video. County Manager Joe Pritchard was audible this time, saying Steve Everett wants to be reappointed to VLCAA, and it’s a four year term. Commissioners had no questions. There were no other nominations. Commissioner Joyce Evans moved, Commissioner Demarcus Marshall seconded, all voted to reappoint Mr. Everett, whom nobody mentioned is the Chair of the Airport Authority, did not appear. Video. Utilities Director Mike Allen said the church wants to add an addition to their existing building which would take away the septic tank, so they need to be connected to county services. He added that this was within the city of Lake Park. He said there was an update since the previous morning’s Work Session: the church only wants to connect sewer and not water, and they’d be willing to pay one and a half times the school rate. When they need water, they’ll ask, and then the sewer rate will go back to normal. This time he didn’t mention “Mr. Harrington”, who presumably is Robbie Harrington, pastor of Calvary Baptist Church in Lake Park, but why should we have to go look that up? They voted unanimously to approve. Video. 911 Director Danny Weeks briefly mentioned the “bunch of stuff we’ve had stored out behind the 911 center for a while” he had discussed in the previous morning’s Work Session. 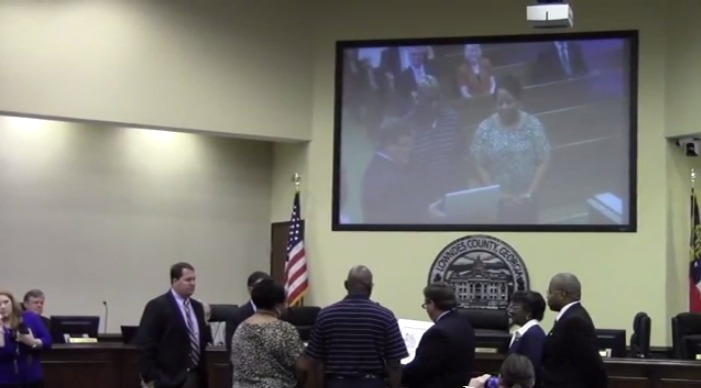 This time Commissioner Demarcus Marshall wanted to know if county employees were allowed to bid. Answer: no. Unanimous approval to dispose. Video. It’s for the 311 contract with MIDS, Inc. MIDS found three inconsistencies in the contract the county approved last year, and he was proposing to fix those inconsistencies at no cost to the county. He didn’t say, but they approved it 12 November 2013. It’s a good thing MIDS checked the County Engineer’s work. Maybe somebody at the county should check our work. These discrepencies didn’t cost anything, but all those change orders do. 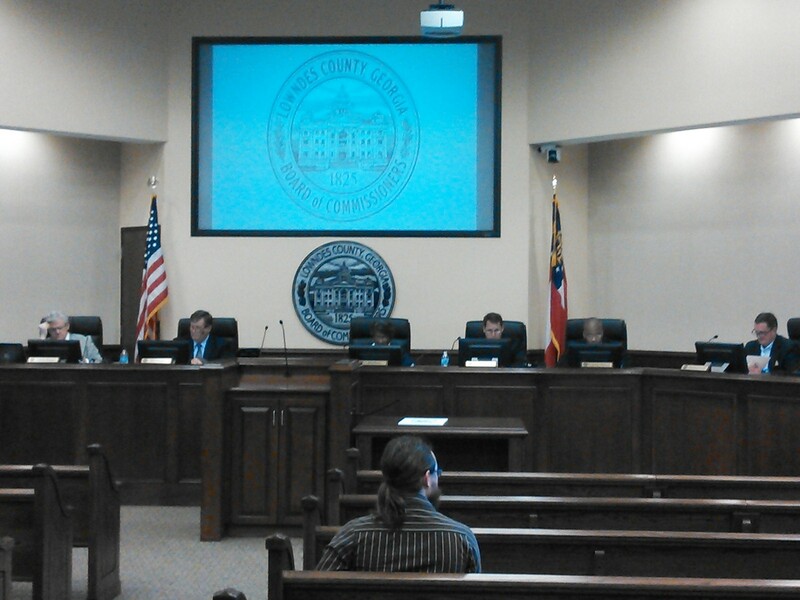 The Commissioners unanimously approved this MIDS contract change with no discussion. Video. County Engineer Mike Fletcher said it was from Boring Pond road to Lake Park Road, no houses, primarily woodlands owned by the Langdale Company. He said last time they did traffic counts, there were fewer than ten cars a day. Which is different from what he said at previous morning’s Work Session: “Last traffic count… seven cars a day.” Commissioner Richard Raines clarified that they weren’t voting to abandon now, merely to schedule a public hearing, which they then did, unanimously. Abandon Excess Right of Way on James Rd & Riverside Dr. When James Road was realigned a couple of years back, along with Riverside, there was some excess right of way that was left on. He proposed quit-claiming the excess and giving it back to the adjoining landowners, the Payne and Smith families. 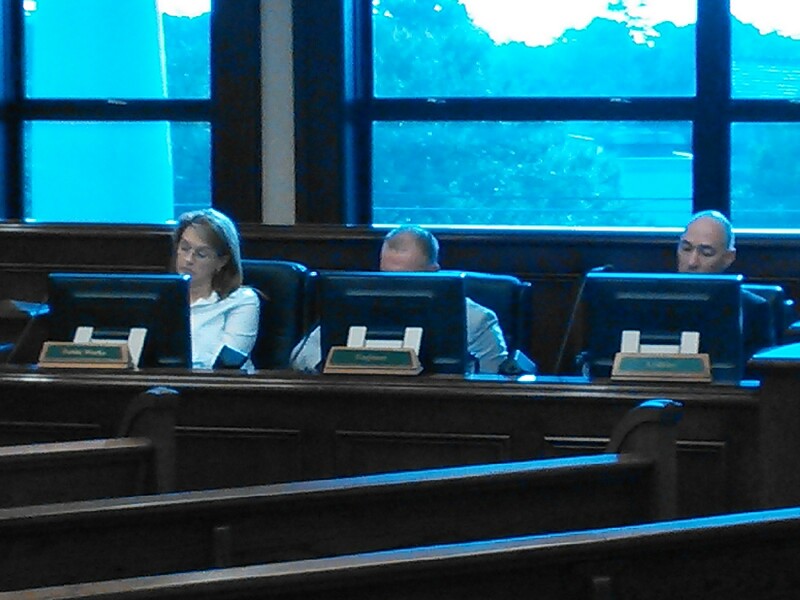 At the Regular Session Commissioner unanimously voted to schedule a Public Hearing for abandonment. Beer License — OMHARI Corp. — 4593 N. Valdosta Rd. Video. Finance Director Stephanie Black said it was the usual. No questions. Unanimous approval. Video. 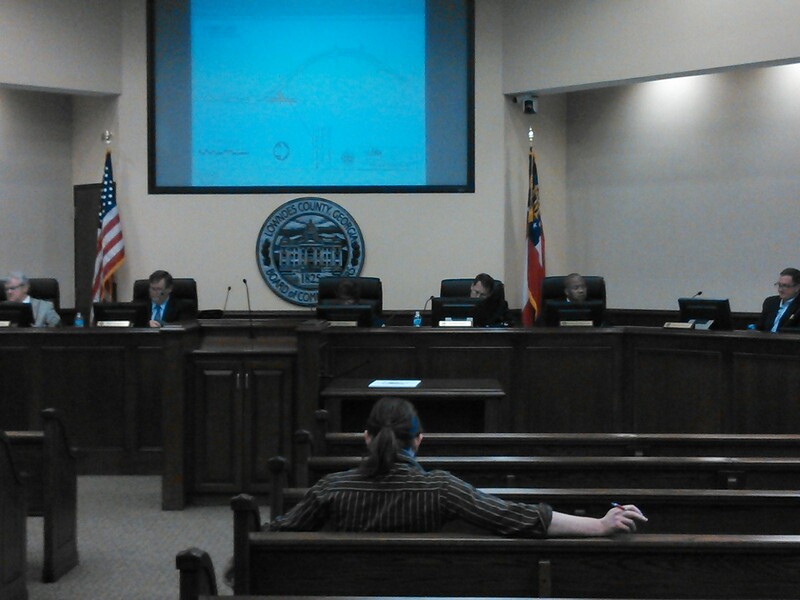 Commissioner Demarcus Marshall said he’d looked into the bids and commended Utilities Director Mike Allen on handling it. He was apparently alluding to his question in the previous morning’s Work Session about why there was “such a gap” in the bids. We still don’t know what the other bids were. 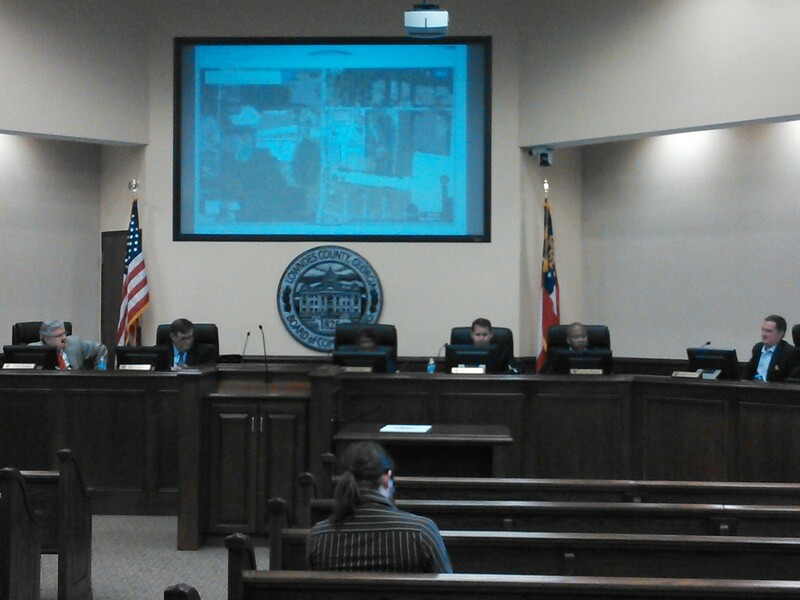 Commissioners unanimously voted for the low bid by Randy Plumbing for $131,059.68. 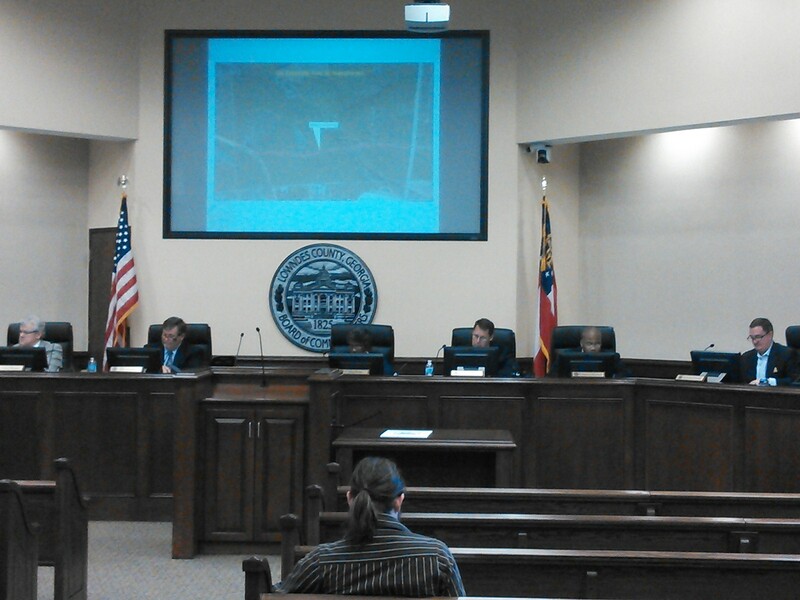 County Manager Joe Pritchard said the emergency situation on James Road was “a failure of some of the asphalt”. County Manager Mike Fletcher said when they began excavating they thought it might be a water, sewer, or storm drain break, but they found it was due to some “unsuitable material”. They brought in some structural fill. Then, due to moisture in the soil, they blended in soil. They were waiting to see if “everything stays tight” before paving. At the previous morning’s Work Session Pritchard said this would be paid for out of contingency funds, but at the Regular Session he said it was too large for that and would have to come out of SPLOST funds. He also promised the previous morning to say how much it would cost, but he didn’t say at the Regular Session. At the Regular Session nobody mentioned the problem was that James Road in front of West Side Elementary School dropped 10 inches in about 48 hours, nor that they did a compaction test in 2008 that didn’t detect any problems, nor did they mention the name Scruggs, nor that there was only a one-year guarantee, which is why the county has to pay to fix it. Maybe the county could check road contractors’ work better. It might also be worth checking more before signing up for big projects for out-of-state developers like that 2007 James Road second mall and massive subdivision mega-project. Quarantine due to a case of distemper to be lifted “tomorrow morning” because there had been no other cases. Reminder that next Work Session will be Tuesday (27 May 2014) due to the holiday (Memorial Day 26 May 2014). Apparently no citizens wanted to speak. Valdosta, Lowndes County, Georgia, 13 May 2014. This entry was posted in Alcohol, Animals, Government, Lowndes County Commission, Religion, Transparency, Transportation, VLCAA and tagged 13 May 2014, Alcohol, Animals, Georgia, Government, Gretchen Quarterman, James Road, LAKE, LCC, Lowndes Area Knowledge Exchange, Lowndes County, Lowndes County Commission, Market Street, Regular Session, Religion, Transparency, Transportation, Valdosta, Valdosta-Lowndes County Airport Authority, VLCAA on May 26, 2014 by John S. Quarterman.